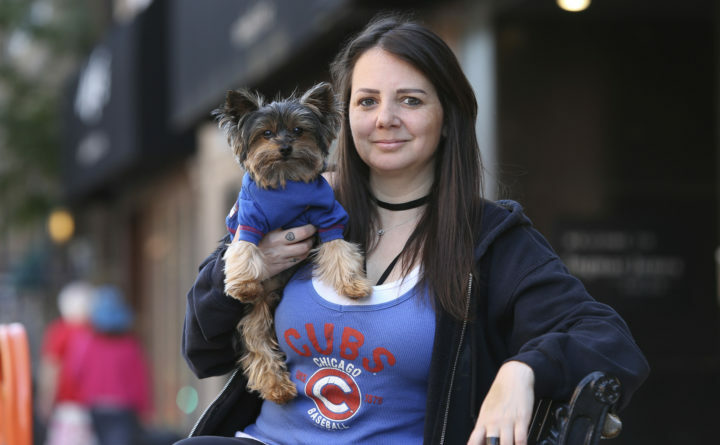 Lauren Pestikas holds her dog Sambuca in Chicago, Aug. 1, 2018. Since starting treatments with ketamine infusions, she says she feels much better for a few weeks after each session. Her monthly infusions last about 45 minutes and cost $550 each. Pestikas struggled with depression and anxiety and made several suicide attempts before starting ketamine treatments earlier in the year. The price tag so far is about $3,000, but “it’s worth every dime and penny,” the 36-year-old said. Ketamine’s potential for almost immediate if temporary relief is what makes it so exciting, said Dr. Jennifer Vande Voort, a Mayo Clinic psychiatrist who has treated patients with depression since February. Last year, Sanacora co-wrote an American Psychiatric Association task force review of ketamine treatment for mood disorders that noted the benefits but said “major gaps” remain in knowledge about long-term effectiveness and safety. Most studies have been small, done in research settings and not in the real world. “He said, ‘Doc, give me what I got last time. For about three weeks after I got it I felt so much better,'” Khare recalled. Typical treatment at his clinic involves six 45-minute sessions over about two weeks, costing $550 each. Some insurers will pay about half of that, covering Khare’s office visit cost. Patients can receive “booster” treatments. They must sign a four-page consent form that says benefits may not be long-lasting, lists potential side-effects, and in bold letters states that the treatment is not government-approved. Meanwhile, dozens of studies are underway seeking to answer some of the unknowns about ketamine, including whether repeat IV treatments work better for depression and if there’s a way to zero in on which patients are most likely to benefit.